Have you ever noticed that it is it virtually impossible to find Irish grown asparagus in the shops? Every once in a while you might see British asparagus in M&S and it’ll cost you a pretty penny. It’s more common to see Spanish, French or Thai asparagus (asparagi?) alongside the ubiquitous and much maligned Peruvian variety. Well, as you can imagine, every spear of this spring vegetable that has passed my lips since has paled in comparison. 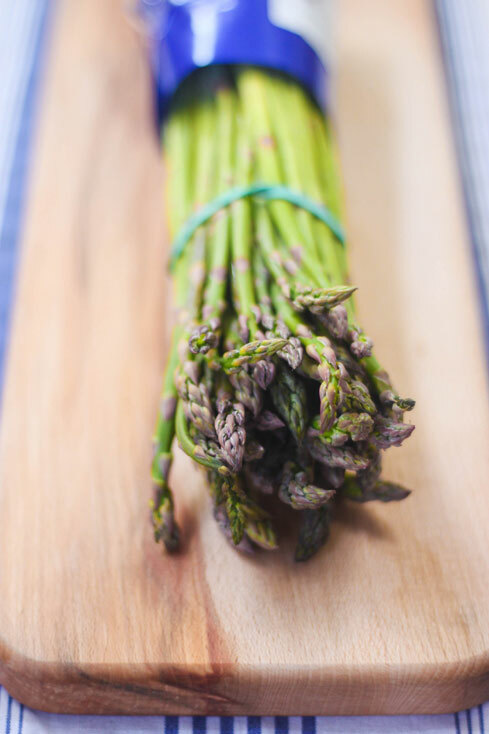 I got a very lovely bunch of Spanish asparagus in my Home Organics bag a week ago and it got me thinking about Irish asparagus. Is it grown here? Can you buy it anywhere? Is it better than the imported varieties or did I just have a magic moment in The Tannery? Questions on a postcard or in the comment box at the bottom of the post, please and thanks. Isn’t it brilliant when you find out that something that looks impossible to make is actually incredibly simple? 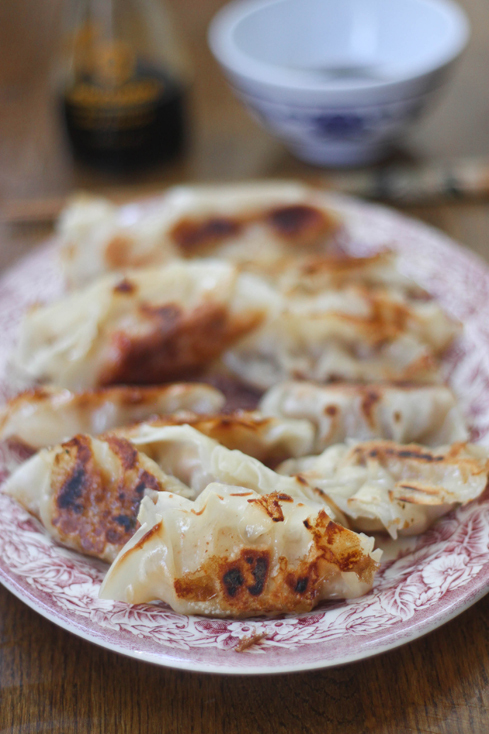 My most recent nomrevelation has been gyoza. 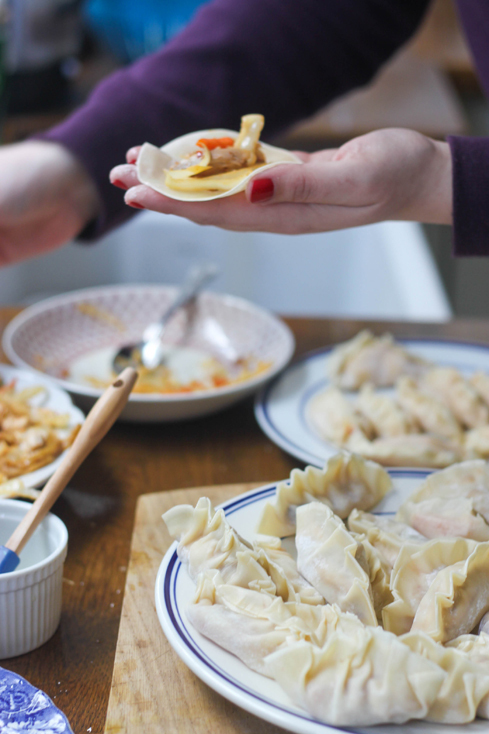 With the help of some handy ready-to-roll gyoza pasty discs that I found in Asia Market on Drury Street – amazingly named Happy Belly Gyoza Skins – it turns out making your own dumplings is a piece of cake. I shared a recipe in Weekend’s Naughty or Nice column over the weekend, to correspond with Aoife B’s much less naughty Udon Noodles with Purple Sprouting Broccoli. The recipe, which you’ll find after the jump, uses pork meat to flavour the dumpings. I’ve since made them with leftover roast chicken meat and got my Roller Derby buddies Claire and Sara over after practice to help me roll them. There’s a slight knack to rolling them but basically if you get the pastry to stick together, you don’t really have to worry about making them amazing. However, I have included the most incredimaze instructional video of all time at the bottom of the post. It’s from a Japanese TV programme called Cooking With Dog and it’s not what you think. I promise. And so I thoughtlessly cast cauliflower aside in favour of my new favourite thing: Beetroot Hummus. Having first tasted it at Skinflint, I’ve made this a few times over the last while and not only does it have the most amazing colour, it tastes amazebombs AND it’s a piece of cake to make. It’s a bit time consuming as you have to roast the beetroots for an hour before you can use them, but other than that it’s a case of whacking everything in the food processor and giving it a good whizz. I served this as an accompaniment to roast lamb, as a sandwich filler, and just on its own with some lovely pitta bread. It’s the beet’s knees. GEDDIT? My tummy did very well out of this Easter weekend, though my waistline may have taken a hit from all of our indulgences. Myself and Niall had some good friends over for lunch on Saturday and served up a slow-roasted shoulder of Pat Whelan’s lamb which we picked up at Avoca Monkstown on Friday. I followed this recipe for Pomegranate marinated lamb and it went down a treat. We fed six with a 2.6kg piece of lamb and had enough leftover for a lovely supper on Sunday. Instead of making my lamb meatball recipe from myself and Aoife B’s column on Saturday the 7th of April in The Irish Independent’s Weekend magazine, I set to work on making Aoife B’s gram flour flatbreads instead. Using gram flour, made from ground chickpeas, means that these little beauties are gluten free as well as being vegan friendly. They were a piece of cake to make, too, and were a brilliant accompaniment for our leftover lamb. The food section also included a review of La Dolce Vita by Paolo Tullio and some very yummy looking cake recipes by Sally Bee. Yes! I know I’m in danger of seeming evangelical about roasted cauliflower at this stage but this little risotto recipe is not the work of a caulifundamentalist, I promise you. Our weather in Dublin has been (surprise!) rather changeable of late and I always think a good risotto is a great dish for transitional seasons. 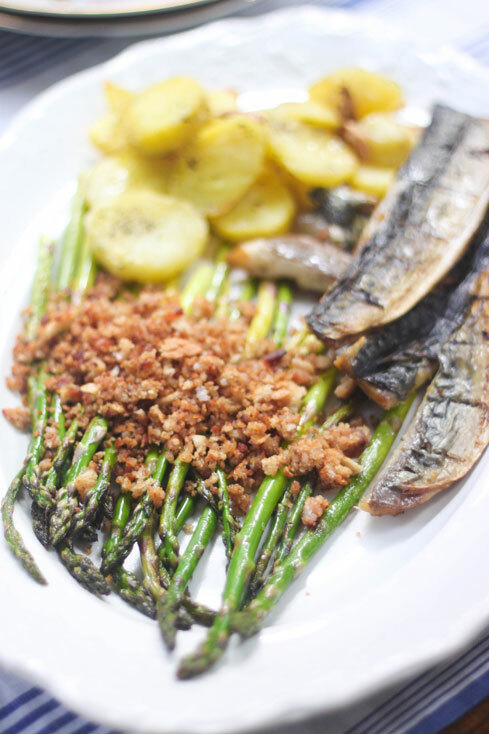 It can be ultra comforting yet it’s easily brightened up with the use of spring and summer vegetables. I happen to find stirring risotto quite therapeutic, as there really isn’t much to do but stand over it and stir for 20 minutes or so. Some people find this tedious while others have The Fear about risotto. As with everything, it’s a practice makes perfect kind of thing. But there’s definitely no need to mystify it either. My own risotto might not impress an Italian Mamma but it always goes a long way to cheering me up when I’ve had an bleurghsome day. And, let’s be honest, with all of the cheese and butter that’s added at the last minute, you can’t really go wrong. Bounty, one of my newly acquired Barna buddies. So was myself and Niall’s observation upon our arrival in Barna (or Bearna as it’s known to Gaelgoirs) last Friday. And I hope no one takes offence to that. We weren’t being snooty city slickers. It’s actually a fact. A small satellite town about a fifteen minute drive from Galway city, we had been invited down by the General Manager of The Twelve Hotel Fergus O’Halloran to get our Barna Passports along with a few other bloggers and journalists. We weren’t at all perturbed by the size of our new home for the weekend. Our itinerary was packed to the rafters so there had to be more activity in this petite seaside spot than first impressions might suggest, right? That’d be right. As you may or may not know, I co-write a column called Naughty or Nice with the wonderful Aoife Barry in The Irish Independent’s Weekend magazine on Saturdays. Each week, we try to think of delicious and quick recipes that can cater for those naughty and not-so-naughty eaters out there. If you’re a regular reader of this blog, or indeed follow me on Twitter and Instagram, it will come as no surprise that I look after the Naughty recipes. I come up with simple, slightly bold recipes to which Aoife B offers a much less bold, often vegan, alternative. I’m going to start posting some of my favourite recipes from our columns, in case you are either too far away to pick up a copy of the Irish Independent on Saturdays or happened to miss it over the weekend. For a look back on the rest of the food section from Weekend, which includes a review of Bear by Paolo Tullio, have a look over here. It’s really beginning to feel like spring around my neck of the woods in Dublin. But, as those of you who live here or have visited, our completely bananas weather means that it may feel like spring in the morning before hopping back to winter in the afternoon and ending the day with an autumn evening. As I’ve said before, it’s great to have a few recipes under your kitchen belt that can bridge the gap weather-wise. I’m starting to crave bright and fresh salads but, as we’re still not out of winter’s gate just yet, there’s a tendency to reach for wintery vegetables which are so good at filling the belly with comfort. Last week I was looking for the culinary hug a bowl of root vegetable salad might offer. I had some carrots and red cabbage in the fridge, as well as some lovely blood oranges in my fruit bowl. There was a bit of St Tola’s goat cheese that needed using and some lovely Pumpkin Seed Oil that the Gunter’s gave me for my birthday that I really wanted to get drizzling with. Almost by accident, I put together a really lovely little salad that I’m pretty sure will be appearing on my table through the transition of the seasons. Or should that be a cakey bread? This was a lovely little loaf that I put together over the weekend, inspired by this recipe but making a few little adjustments here and there to it. The result is definitely more of a cake than a bread, with the syrupy oranges adding an amazing sweetness and the cardamom giving it an intriguingly subtle spiciness. It was also wonderously simple to put together so maybe keep it in mind the next time you have a few sad looking bananas lying around the fruit bowl. Definitely a fabulous way for a banana to go.